We’re back! We’ve had a very busy start to the year and while we’ve been planning our weekly menus and cooking a lot of fun dishes (like Food & Wine’s Piri Piri Chicken with Crispy Potatoes and Southern Living’s Chicken and Sausage Jambalaya), we have not had time to post our menus. Now that spring is upon us and summer is not too far away, we’re going to get back to posting as regularly as we can. This Saturday, we took our annual early spring trip to the North Fork of Long Island. The farmstands were still closed for the offseason, so we weren’t able to buy the beautiful heirloom tomatoes and fresh sweet corn that we look forward to so much. We were, however, able to visit the Southold Fish Market and buy the super-fresh seafood that we already enjoyed last night and will enjoy tonight and tomorrow night as well. We should also mention that we visited the Catapano Dairy Farm, where we not only purchased a lot of goat cheese but also got to play with a two-week old baby goat. Dinner Saturday night — Beer Steamed Mussels and Clams — featured, as one would expect, lots of fresh mussels and clams. We started with some smoked bluefish pate (also from the Southold Fish Market), which we ate on slices of French baguette from The Blue Duck Bakery Cafe in Greenport. We paired the pate with a beer from the Greenport Harbor Brewing Company: their hoppy Otherside IPA. We managed to save one cup of beer to cook with and used it to steam the mussels and clams, which we enjoyed with the rest of the bread and more beer. The Southhold Fish Market was featuring Peconic Bay scallops, so we decided we needed to make Ina Garten’s Coquilles St. Jacques, which we have enjoyed a few times before. The recipe comes from Ina’s Make It Ahead cookbook. While we typically don’t make things ahead, the amount of scallops we bought is more than we can eat in one sitting, so we’ll prep three servings of this dish, but only cook two tonight. 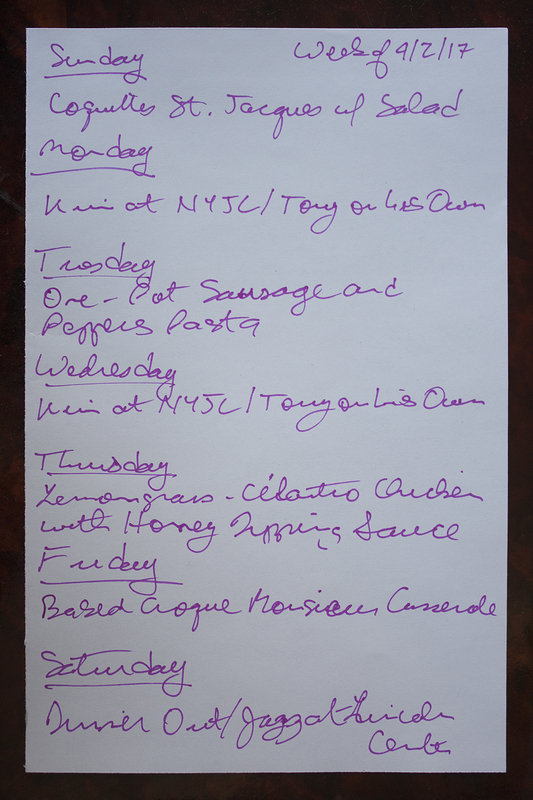 Tony will have the third serving tomorrow, while Kim is at a meeting of the New York Junior League. For his birthday, Tony asked for and received a sausage making class at White Gold Butchers. He thoroughly enjoyed the class and came home with about two pounds of fresh Italian sausage. We used half of it to make sausage and polenta and will pull the remainder out of the freezer and use it on Tuesday to make One-Pot Sausage and Peppers Pasta. Kim has another Junior League meeting on Wednesday, so Tony will head to Astoria to have dinner with his mom. We’ve been making more Asian influenced dishes recently, and will make another on Thursday: Food and Wine’s Lemongrass-Scented Chicken with Honey Dipping Sauce. The chicken needs to marinate overnight, but that will be the easy part. Since we weren’t able to get the main ingredient — boneless, skin-on chicken breasts — Kim is going to try her hand at butchering a bone-in, skin-on chicken breast. We have plans to see a concert at Jazz at Lincoln Center on Saturday night, so we’ll probably have dinner somewhere near Columbus Circle, but Kim picked out a great recipe for Friday night: The Kitchn’s Baked Croque Monsieur Casserole. This recipe takes the traditional croque monsieur sandwich and casserole-ifies it. It should make for a very fun dinner and at least one or two brunches over the weekend.